Made with real ingredients such as real mustard and honey from Australia. One step dressing recipe that saves time and labour. When it comes to salads, the quality of the dressing is as important as the vegetables that I use. 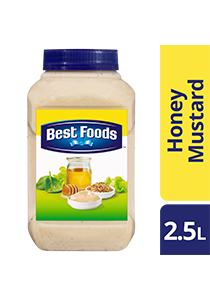 Best Foods Honey Mustard Dressing is made with real mustard and honey to deliver great taste. May contain traces of cereals containing gluten, soy, fish, milk, and peanut.